The 100 Black Men of New York honored business, finance, real estate and health care titans at their 29th annual benefit gala, February 26th at the New York Hilton grand ballroom. 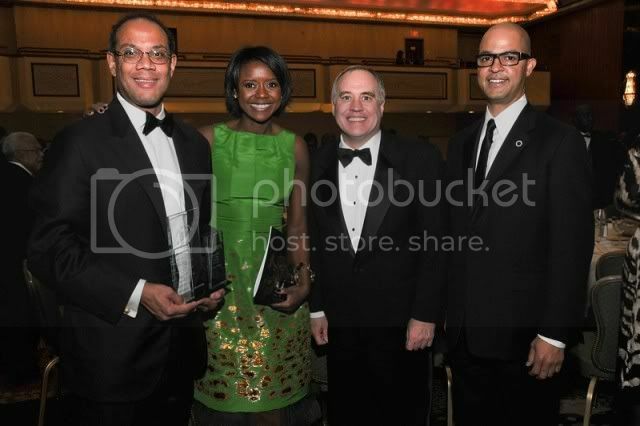 Pictured are honoree John Rogers, Chairman and CEO, Ariel Investments; Mellody Hobson, ABC News money expert; Honoree Tom DiNapoli, New York State Comptroller; and Craig Simmons, Gala Chairman. “Recognizing Our Past, Shaping Our Future” was the theme for the event, that featured a VIP reception at 6:30 p.m. Dinner and awards began at 7:30 p.m. followed by dancing. 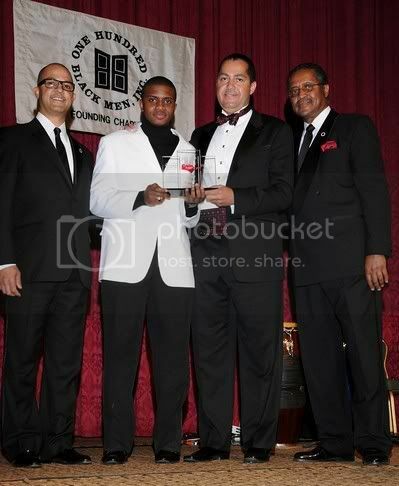 The Black Tie event, hosted by WNBC-TV Anchor and Reporter DeMarco Morgan honored Thomas P. DiNapoli, the 54th Comptroller of the State of New York; R. Donahue Peebles, Chairman and Chief Executive Officer of The Peebles Corporation; John W. Rogers, Jr., founder, chairman and chief executive officer of Ariel Investments; and Malcolm D. Reid, MD, Assistant Secretary of the Medical Society of the State of New York. 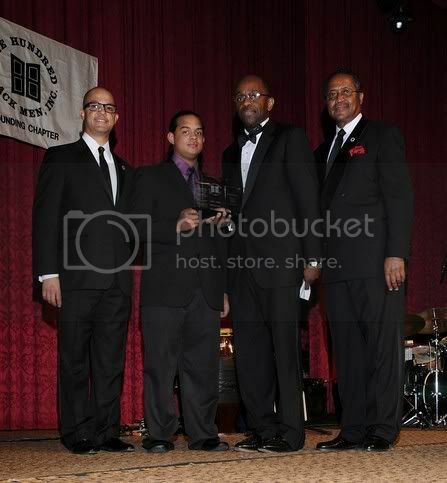 Craig Simmons, Rick Colon (Eagle Academy student), Dr. Malcolm Reid, and Philip Banks, Jr. Notable guests included Governor David Paterson, Mayor Michael Bloomberg, New York City Comptroller William Thompson, NYC Schools Chancellor Joel Klein, NYS Senate Majority Leader Malcolm Smith, District Leader Walter T. Mosley, and Miss USA, Crystle Stewart. Upcoming Event: The 100 Black Men of America, Inc. will host its 23rd Annual Conference in New York City from Wednesday, June 10 through Sunday, June 14 at the New York Hilton. This year’s theme of “Education on the Frontline” will focus on the challenges, successes and issues concerning education in the African-American community. Attendees will engage with the nation’s leading African-American corporate figures, decision makers, journalists, celebrities and others during interactive workshops, thought-provoking panel discussions and various plenary sessions. Past conference attendees have included Bill Cosby, Michael Eric Dyson, Earvin “Magic” Johnson, Tom Joyner, Bishop T.D. Jakes, Chris "Ludacris" Bridges, Congresswoman Maxine Waters and many more. For more information or to register, visit http://www.100blackmen.org/. Thanks to Robin at Rubenstein Associates for the pix! WOW. Mr Peebles looks like he gained a bit but on point glad to see the pics. Thanks - I recently heard Mr. Peebles' aunts speak at an event in DC. He comes from a great family!